Recently, I was contacted by Global Interpark, an e-commerce company in Seoul, whether I would like to chose any product from their shopping mall for reviewing. I didn’t know about Interpark before, but I learnt that they are the very first company to provide e-commerce service in Korea. There are over 800,000 items listed on their website and around 5,000 items are translated focussing on K-beauty and K-pop related items. I used this opportunity and selected the Laneige Multiberry Yoghurt Pack with had been on my wishlist for a long time. Laneige is a Korean brand, part of the Amore Pacific Group. The brand name comes from the french word for snow which is “la neige”. The brand name reflects the beauty of young women between 24 and 32 years by focusing on water as source of life. Therefore the products design is more mature and clean, reflecting the image of moisture obtained through water. The Laneige Water Sleeping Pack is probably the more famous mask pack by Laneige, but the Laneige Multiberry Yoghurt Pack does sound super delicious and on top has a pink colored jar...so what to say more?! :D In contrast to the sleeping pack this pack has to be washed off after leaving it for a couple of minutes on your face. 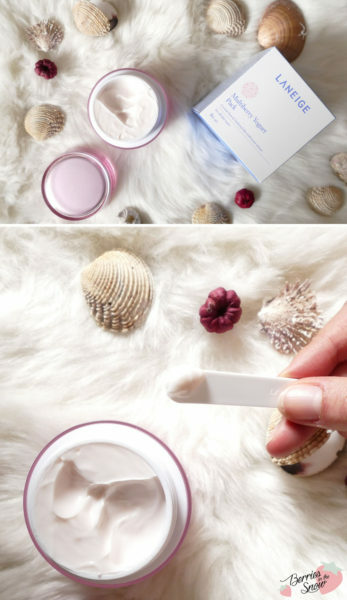 The jar comes in a very simple cardboard box with the typical blue and white colors of Laneige. It doesn’t have many descriptions either, but inside the cardboard box you will find an instruction paper with descriptions, also in English. 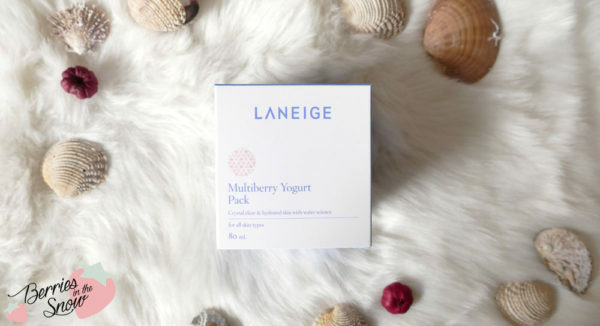 The Laneige Multiberry Yoghurt Pack is ‘designed to nourish the skin from deep inside and leave it supple’. It contains Soghurty, a specialized fermented yoghurt which promotes collagen synthesis and enhances the defense abilities of the skin from harmful external causes, according to the description. The berryblend complex, containing berry extracts from Raspberries, Blueberries, Wolfberries, Cranberries and Strawberries, supplies the skin with antioxidants and delivers nutrition. You can find a list of all ingredients on COSDNA. There are some minor irritants in the list, so be sure to check them out beforehand. There is a spatula included in the packaging, so you do not have to worry about using your fingers for spooning out the pack. It has a creamy consitency and especially a very very delicious scent. I can only say that it smells like fruit yoghirt so I was really tempted to give it a try (but I didn’t!). The color is mainly white, but with a hint of pink. Spreaded it also feels like firm yoghurt and spreads easily, without being drippy. It will stay on your face and you don’t need to worry about dripping it all over. The pack can be left on the face for 5-10 minutes and washed off with lukewarm water afterwards. The skin feels – as promised- supple and nice and nourished and up to this point I cannot find anything negative about it. The Laneige Multiberry Yoghurt Pack fullfilled my expectations in every point. I think that this is a good quality wash-off maks with a delicious scent and this might be the only downside for some people who do not like scented products. I was surprised to read that the yoghurt was fermented, because I didn’t know that before, and as a lover of fermented products I’m happy to have chosen this wash off pack. It will definitely stay in my collection and be used up to its end. 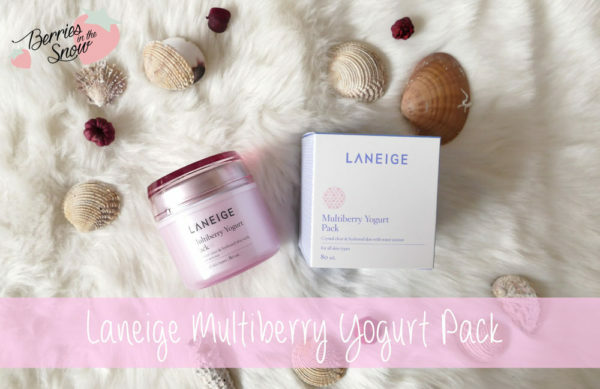 The Laneige Multiberry Yoghurt Pack retails for 18.47 US$ from Global Interpark. 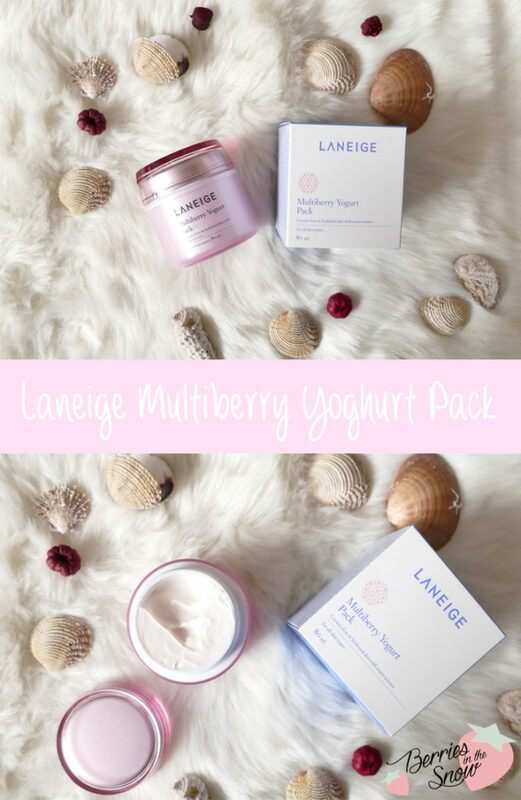 Did you try the Laneige Multiberry Yoghurt Pack? Just as a short reminder: All products mentioned and reviewed on this blog are of my personal opinions. This product here was sent to me for reviewing purpose by http://www.globalinterpark.com/ which doesn’t influence me in providing my honest opinion on the products. Laneige is such a trustworthy brand. Their products are so luxe yet affordable and they generaly deliver what they promise! I never tried this mask pack but it sounds fantastic, Laven. And berries for summer, what else? Oh yes, I love that there are some brand should can simply trust blind eyed…and the smell of this mask pack is so delicious *_* Really like it! Oh I´ve never tried it but l might do as it looks pretty good!